THEN he will be stripped of his 44th president medal, and in the official medal table Real Terminator Clinton will appear as the successor of G W Bush. 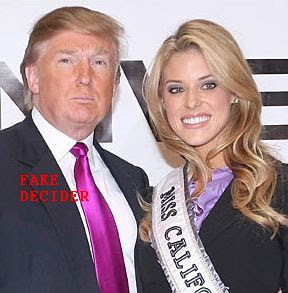 "Miss California" and "US President Obama"
- Fake Decider Donald Trump stepping on stage to complete the act. Trump confirms that "she could have been stripped of her crown". Trump uses the illuminati joke format in a reference to "Obama", for the last "final" words: "these kind of things do NOT happen in America". The only similarity between "Miss California may be stripped of her crown" and "Usain Bolt stripped of his world records and his medals" (4) is that both acts are part of the mind control techniques used to prepare the "President Obama stripped of his presidency" act. That preparation was the reason to stage the Miss California act, i.e. advancing the homosexual agenda and the terror agenda is just added to the act, following the usual illuminati approach of advancing several agendas with the same act. This is the other way round in the case of Usain Bolt. The main reason is to complete the destruction of natural sports while selling the "BIG PHARMA" hoaxes, with the elimination of the world's greatest athlete ever. Yet stripping Bolt of his medals could not be staged at a better moment than shortly before detonating the suicide Obomber. (5) Usain Bolt and Lance Armstrong are the absolute last champions that the brainwashed masses would still expect to hear what do they have to say, after being accused of doping. But they are also ultimate examples of refusing to accept the Truth, because that Truth is TOO HORRIBLE. And like for Usain Bolt (who stated to be "humbled" by Clinton's wish to meet him, after the illuminati tried to kill him) and Lance Armstrong (supported McCain, the ultimate loser icon created by the Illuminati), the horrible thing is that even if it was probably the illuminati who deleted it, it was also possible that the moderator was a real Bolt fan. added June 10: Today Prejean was finally stripped of her crown. Who is the next to be stripped of his crown: Usain Bolt or suicide Obomber, aka 44th POTUS Hussein Obama? Or is there no time left for the execution of Usain Bolt and detonation of suicide Obomber to launch ethnic civil war, before compulsory "Vaccissassination" of the human cattle? intrade, one of the last real markets. Site later shitdown by the illuminati.